BMW is launching a car-sharing program with its headquarters in Seattle. ReachNow, with a fleet of 370 vehicles, will compete in the city with the successful Car2Go service by rival German automaker Daimler. BMW is jumping into the sharing economy in Seattle, with a plan to get you behind the wheel of a Mini Cooper anytime you want one. 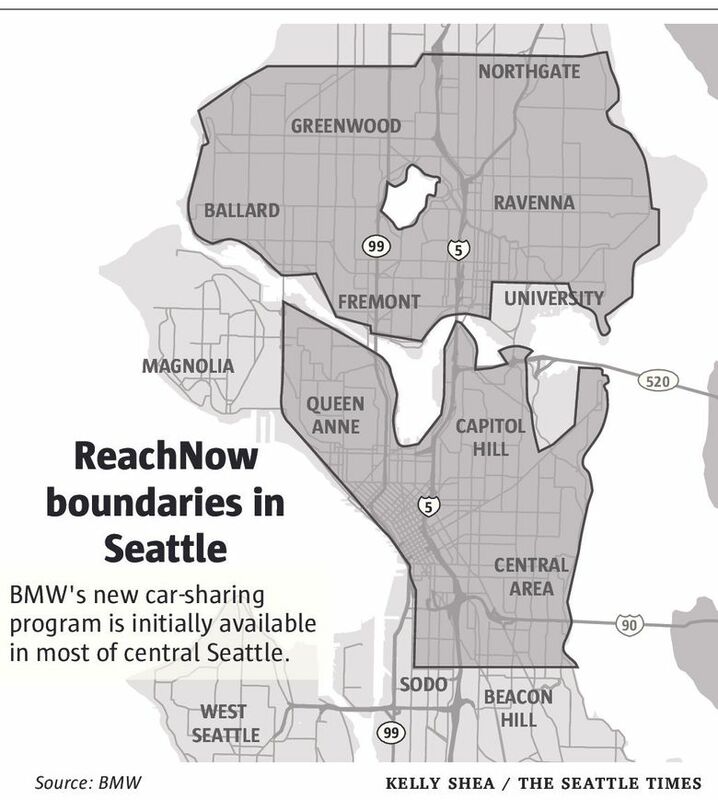 BMW announced Friday it is launching a car-sharing program, ReachNow, in Seattle, and setting up the division’s North American headquarters at a Belltown office. Drivers will be able to hop in one of the fleet’s 370 vehicles — made up of BMW 3 Series, Mini Cooper or the electric i3 cars — and drop it off in any parking spot within most of Seattle. The service puts BMW in competition with Car2Go, the car-sharing program using tiny, two-door Smart cars that has boomed in Seattle since it launched more than three years ago. ReachNow will expand to three more cities within the year, and plans to eventually operate in 10 North American cities. The service is the initial piece of a larger mobility program for BMW, said Peter Schwarzenbauer, company board member. Eventually, BMW will add a car service that comes with certified drivers and a way for BMW owners to rent out their own cars, he said. “We will be covering all the mobility needs our customers have,” Schwarzenbauer said. ReachNow cars can be reserved and unlocked using its iPhone and Android app. For initial registration, the company uses fast-identification technology that scans driver’s licenses and faces, aiming to make it a two-minute process. ReachNow’s pricing is similar to Car2Go’s. Drivers pay a sign-up fee of $39, then 49 cents per minute while driving. Car2Go charges a $35 sign-up fee and 41 cents per minute. Both services also have a $1 per-ride fee. In its initial promotional push, ReachNow is matching the 41-cent-per-minute rate and waiving the registration fee. ReachNow’s headquarters, at 2118 Third Ave., will employ 40 people by the end of the year, and will include a storefront to explain the service and help people sign up. Seattle was the ideal place for ReachNow’s headquarters because its tech-savvy population has proved open to car-sharing and the city has created a friendly regulatory environment, said Dana Goldin, ReachNow’s marketing head. ReachNow will start by serving most of central Seattle, from North 105th Street to South Lander Street, but omit Magnolia. The service will expand soon to Magnolia and West Seattle, the company said. The next destination will be Sea-Tac — ReachNow will be available at the airport by the end of June. An airport fee will apply, as it does with many ride-services companies, and BMW said it is negotiating the specifics with the Port of Seattle. Seattle is Car2Go’s second-largest market in the U.S. (behind Washington, D.C.) with 750 cars on the road. The city has more than 75,000 registered members, said Dacyl Armendariz, communications manager at Car2Go, which is owned by Daimler. Car2Go was the first major one-way car-sharing company in North America. BMW isn’t the only other automaker exploring the market: GM launched a pilot program in Ann Arbor, Mich., in January. Armendariz touted the company’s small vehicles as appealing for urban life, and hinted that four-door cars may make an entrance in the future. Car2Go’s testing of Mercedes four-door cars in Canada has been “hugely successful,” she said. ReachNow’s initial fleet will operate much like Car2Go’s, except its employees will be not only fueling the cars but also charging the electric i3’s to make sure all have enough power to get around the city whenever someone wants to use one. The i3 has another connection to the state — a carbon-fiber plant in Moses Lake makes the threads that are turned into the carbon-composite shell of BMW’s i-series cars. ReachNow is similar to BMW’s DriveNow program, a car-sharing partnership with car-rental company Sixt that the company operates in nine European cities. BMW briefly launched a car-sharing service in San Francisco last fall, but shuttered it after coming up against regulation barriers. Based on Car2Go’s success, the city said March 4 it would lift caps on the number of car-sharing vehicles and the number of companies that could operate in the city, according to a Seattle Department of Transportation blog post. Previously, the city council had capped the number at four operators with up to 750 cars each. A study showed that 14 percent of car-sharing members have given up their own cars, meaning up to 9,100 fewer cars are driving on the roads of Seattle. Data in the SDOT study show car-share vehicles generally stayed in a parking spot for an hour or so at a time, meaning they don’t seem to be jamming up parking, the post says. The city has agreements with Car2Go, and with BMW, to issue parking permits so that drivers do not have to pay at legal parking spots. The companies pay the city an agreed-upon amount for the cars to park within the service area. For 2016, Car2Go paid the city about $1.3 million, and BMW paid about $532,000, according to SDOT.